In this third installment in the Kitty Norville series, Kitty has decided to take time off from her work as a talk show radio host and write about her unusual life experiences. Events in the previous volume put Kitty in the unwelcome position of becoming an unwilling celebrity in a most mortifying way. Still, her celebrity status has given her an editor willing to publish a book. So Kitty rents a secluded cabin in the woods of Colorado. But as days go by and she can't seem to write anything, she begins to wonder if taking time off was such a good idea. The wilderness calls to the wolf inside her, and she begins to understand why some werewolves end up staying in wolf shape and never returning to the human world. When she wakes up one morning to find a dead rabbit at her doorstep and a cross of blood on her front door, she feels targeted and frightened. Clearly someone objects to her presence, but Kitty is not one to back down - not even when the "hints" for her to leave begin to escalate. Then Cormac, hunter of rogue werewolves, shows up at her doorstep with Ben, Kitty's lawyer and friend, who is grievously wounded. Even in the middle of nowhere, it seems Kitty will find herself embroiled in trouble. This time trouble has glowing red eyes and the ability to flay an entire herd of cattle with no one, not even the herd dogs, hearing a thing. I enjoyed this installment in the series, although it had a different feel to it than the first two. There was definitely action and adventure, plenty of peril, but somehow it felt like a quieter, more introspective book. Kitty's job as a radio host has been an enormous factor in her growing self confidence, and while the break from the show seemed like a good idea, without that one thing that she does well, that makes her feel confident and in control, Kitty is a bit adrift. Add the fact that she's so alone, when the wolf in her craves a pack, and Kitty is on shaky ground. Still, Kitty soldiers on, doing what she can even when the demands on her seem impossible to meet. It felt believable to me that Kitty's experiences at the end of the second book would leave her feeling unsettled, that she would need some time and space to come to terms with what happened. There is a lot going on in Kitty's mind, and a lot going on with the relationships in her life as well. While I was disappointed with some of the turns the plot took, I always felt that, under the circumstances, Kitty made the right decisions. She is an admirable heroine, and I'm very much looking forward to her further adventures. 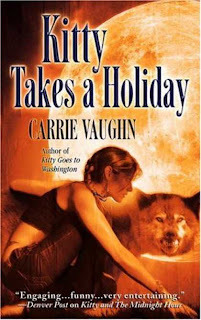 Eclectic Closet: "Carrie Vaughn continues to exhibit strong writing in the Kitty Norville series. She has created a solid alternate reality to modern-day America with each novel adding depth to her world." The Movieholic and Bibliophile's Blog: "To be honest, compared to the first two books, Kitty Takes a Holiday is actually somewhat dull....this was still a really great story. Just not really on the same level as the first two." My Friend Amy: "This one is probably the darkest of the Kitty books I've read so far." Pat's Fantasy Hotlist: "Kitty Norville is so genuine that, even though this series contains vampires, werewolves, and other creatures of the night, Vaughn weaves it all together and create an unmistakably 'human' tale." This is in reference to your eating alone post - I am not super keen on eating alone, probably because of the social stigma associated but on the flip side, I love traveling alone! I am looking forward to starting this series soon as well. It's always good to know that it maintains momentum after the first one. Eating alone - I travel alone with work a lot and never mind eating out by myself. I always take a book for company which wprks out fine.